The post gives a brief introduction to containers, discusses some immediate benefits of adopting containers in your organization, and some predictions about how containers will affect IT this year and beyond. 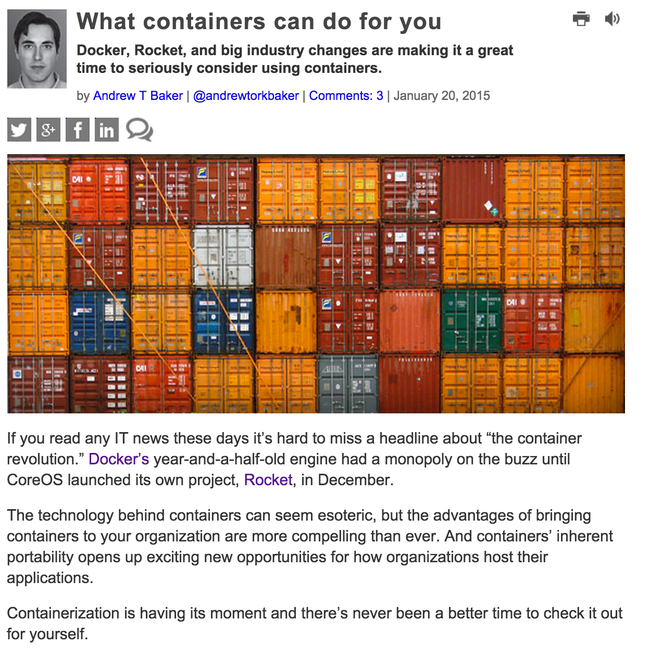 It’s a great primer if you’re considering using Docker or Rocket in 2015. Check it out for yourself! When I first considered becoming “funemployed” to expand my development skills, there was one tech at the top of my list: Node.js. I had been curious about Node for a while, and after a couple tutorials I was ready to dig in and build a project with it. Around the same time, Instagram released Hyperlapse, a new iOS app that helps you make stabilized time-lapse videos easily. I was playing around with it at home and joked to my girlfriend that it would be funny to put a bunch of Hyperlapse videos to dubstep music. Thankfully, she persuaded me to try something gentler. A couple weeks later Hypermasher was ready for the world. Check it out for yourself: www.hypermasher.com. In the summer of 2012 I went to see Scott Berkun speak at a local meetup in DC. Berkun is an author who writes about creativity, philosophy, and management with a focus on tech. I later ordered and read his most recent book at the time, Mindfire. Berkun is a great essayist, and some of his words have stuck with me years later. There’s one essay I particularly took to heart: “How to make a difference”. It’s a short read - I highly recommend it. In the essay, Berkun recounts an experience during his last days at Microsoft. After a final lecture in front of his peers, Berkun is struck by one colleague’s straightforward, personal expression of gratitude for all Berkun’s work. Berkun remarks that such expressions are exceedingly rare, which is a shame considering the powerful positive effect they have on their recipients. Today I’m excited to open source my winter side project, spin-docker - a lightweight, RESTful, docker-based platform as a service. You can check out the spin-docker code on Github or the extensive documentation on ReadtheDocs. Even though docker itself is barely one year old, spin-docker joins an already exciting lineup of docker-based PaaS tools: dokku, Deis, and Flynn to name a few. So while I love my ~400 line Flask app, I concede that it’s unlikely to propel me to fame and fortune. I started working on spin-docker because I had a problem. I have been hooked on Fog Creek’s Trello ever since @htammaro turned me on to it about a year ago. Trello won me over initially with its intuitive UI and easy setup, but I have become an advocate of the tool for one simple reason: most of the time, it just works. Trello has great collaborative features which make it a favorite with small teams, but when I started using it for my personal to-do list, I found more benefits than I expected.